Tickets were prepared in a way that would maximize their functional aspects such as keepsake value, examination, spectator guidance and access control, in addition to reflecting the Games' image. Prior to the printing of tickets and beginning in July 1984, the SLOOC collected and studied ticket-related information from the official reports of past Olympic and Asian Games and various other ticket samples. Designers were selected and requested to submit draft designs, which were carefully reviewed before being finally adopted. The Korea Security Printing and Minting Corp. was chosen as the ticket printer on March 14, 1987 in consideration of its ability to produce special paper, prevent counterfeiting, and to classify, inspect and calculate the printed tickets flawlessly. The basic agreement on the printing and supply of the Games tickets was concluded on July 27 same year. Varying data for some 4,620,000 tickets in 2,093 kinds were computer-printed with a laser printer by the Ssangyong Computer Systems Corp. The design was a focal point in the printing of tickets. 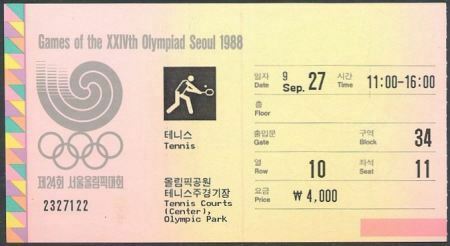 In determining the design of tickets, the SLOOC decided that it should duly reflect the Games symbolism and the unique Korean estheticism as a Seoul Games souvenir, as well as the functional efficiency for ticket examination, spectator guidance and access control. Three basic designs were to be prepared, one each for Opening and Closing Ceremonies and one for sporting events. A number of leading designers were chosen and each of them requested to produce two draft designs. Under the plan, a contract was concluded with two designers recommended by the Design Consultants Committee on March 26, 1987. The two designers each produced two draft designs from which the work of Professor Yang Sung-chun of the Fine Arts College of Seoul National University was chosen. Some modifications were suggested by the SLOOC and a modified version was finally adopted on July 20, 1987, after being reviewed by the relevant officials of the SLOOC and the Korea Security Printing and Minting Corp. as well as by the Design Consultants Committee. The basic design was intended to emphasize the Games being a universal sports festival for the entire human race, and the traditional patterns of Korea, the host country. Tickets were 170mm wide and 75mm long, designed to be torn off in part at venue entrances. The data printed on the front included the names of the Games and event, venue, pictogram, date, time, gate, floor, seat row and number, price, ticket code, serial number by code, and symbol of event. On the back were printed public notices and advertisement. Both Korean and English were used. The ticket code, essential to the computerization of the ticketing program, appeared at lower left in seven-digit figures. The first two figures denoted the sport involved, the next two the time of the competition, the fifth the ticketed session, the sixth the seat class, and the seventh figure the check digit. White paper of special quality almost comparable to the paper for bank notes, produced by the Korea Security Printing and Minting Corp., was used in printing tickets. To prevent counterfeiting, the Games emblem was imbedded in watermark, and the name of the Games was entered in microprinted, special silver lines, among other notable security features. No fewer than 2,093 kinds of tickets specifying event, venue, time and seat class were printed. When it came to designated seats, moreover, each ticket had to bear a different seat number. Since the printing of this vast number of tickets under the ordinary printing method required the reinforcement of special facilities, a long period of time and enormous expenses, the common elements, such as the basic design, common characters, the name of the Games, advertisements and public notices, were printed under the ordinary printing method, while such variable data as the name and time of competition, price, seat number and the management number, were computer-printed. Basic offset printing was done at the Korea Security Printing and Minting Corp. from January 28 to February 21, 1988. As for computer-printing, the Ssangyong Computer Systems Corp. took charge of the development and operation of software. Using eight laser printers provided by IBM Korea INC, Ssangyong finished printing the variable data by August 21, 1988. Upon completion of computer-printing, tickets were brought back to the Korea Security Printing and Minting Corp. where they went through the processes of cutting, stitching and puncturing along the tear-off line before the final quality inspection was made. In printing, particular attention had to be paid to the adjustment of work schedule by process, development of computer-printing software, preparation and confirmation of input data for over 4,600,000 tickets, and security features. But, the entire process of printing was undertaken successfully without a single mishap. The tickets thus prepared totalled 4,435,505, which broke down to 4,291,004 for sporting events, 72,274 for the Opening Ceremony and 72,227 for the Closing Ceremony. In addition, 181,996 tickets for miscellaneous purposes, such as complimentary tickets, tickets for rehearsals and ticket specimens, were produced.